No VAT added to any price on this web site. 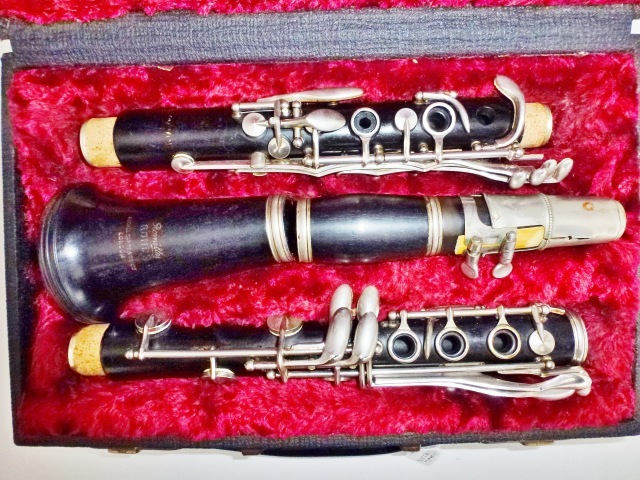 207962 & 273492. comes with case, 2 mouthpieces, Lig & Caps. If you live in the U.K I can arrange for you to have these lovely clarinets on approval. In order to give them a test drive, so to speak. Please ask for details. Provided you are resident in the U.K I can send these to you on approval. Please ask for details. 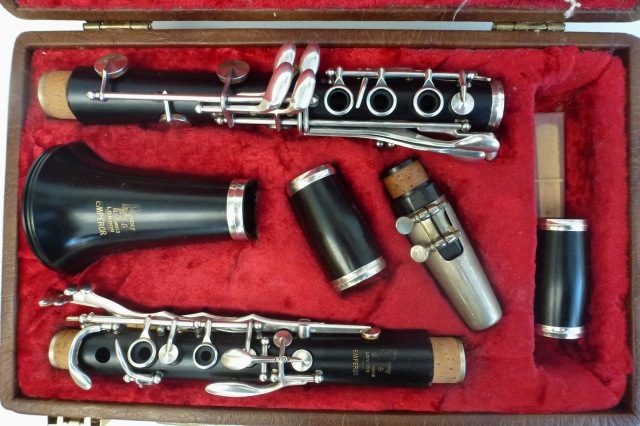 An unusual and somewhat rare wooden Bb clarinet made by Selmer. Known as the Manhattan, recognised by the Manhattan Skyline Logo. No cracks, chips or pinning. Nickel Keys to are all in remarkable good condition. I have given it a good overhaul, using brown leather pads, so is all ready to go. Would suite an intermediate or advanced player who would probably appreciate the lovely bore and the undercut tone holes both of which go together to make this a truly excellent instrument. I have found a decent ebonite mouthpiece to go with it, plus a lig and cap. I am throwing in a brand new case as well. A collectors piece I would venture to suggest you grab it, while it is there if I were you. 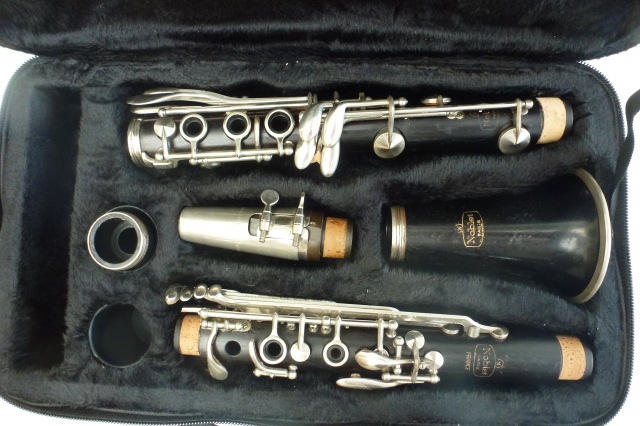 serial no 466151 Boosey & Hawkes Wooden Imperial Bb clarinet .I have overhauled it using brown leather pads, new cork etc .I have also oiled the body and it is in full working order. No cracks, pinning , Chips, etc. The keys are in good condition, the silver plating shows little wear, if any. Ideal for intermediate or seasoned player. I do not know the age but the serial number is 466151 . Nice mellow sound. Comes with a hard case. Alas there is no mouthpiece but I am sure I can find something for you If you live in the U.K I can arrange for you to try on approval, with no obligation. Just ask for details. Though there was no mouthpiece I am sure I can find you one. 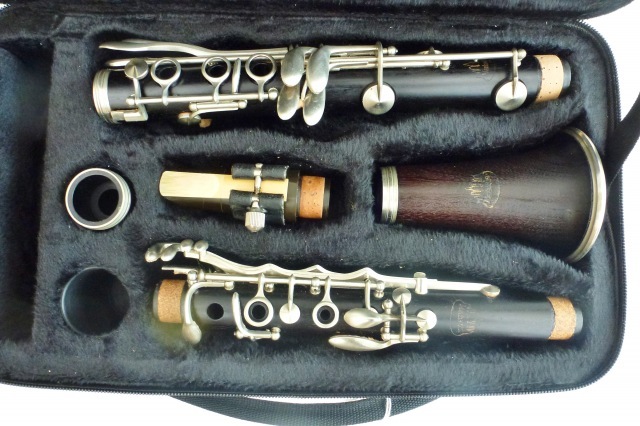 serial no 217682 Boosey & Hawkes Wooden Edgeware Bb clarinet . Sadly no longer made. Certainly sort after by those players who are looking for a quality instrument. Has been through my workshop and is in full working order. I do not know how old this instrument is but the serial number is 217682. I have serviced this instrument so is in full working order. I have oiled the body,inside and out .I have oiled the key work. Incidentally,there are no cracks,splits,chips or pinning . The barrel and bell which are also wooden have also been oiled. The keywork is in very good condition. a little wear here and there but not much to worry about. The clarinet has been corked and so it is now in full working order. Has a beautiful mellow tone. Should be ideal for someone who does not want to spend a huge amount on a new wooden instrument. Suite an intermediate or possibly maybe a beginner. Comes with a hard case,a Boosey & Hawkes mouthpiece and a Lig and cap. Comes in original case. I will throw in a reed well. More photos Available on request. 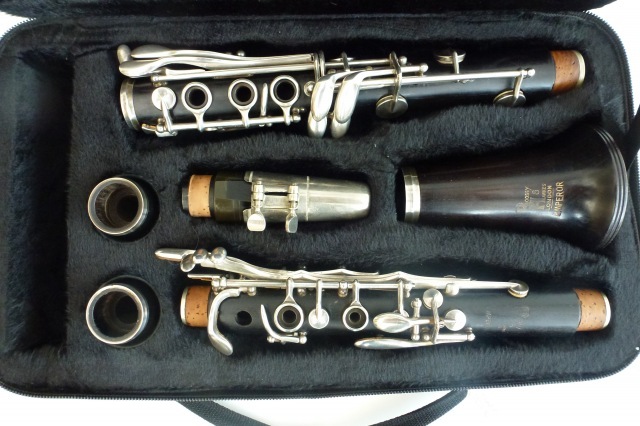 Pair of Noblet Artist wooden Bb & "A " clarinets. Both have been through my workshop. Neither has any cracks in the body or been pinned, no chips etc. Both have been totally overhauled with nice brown leather pads .Key work in excellent condition. They both have have a rich fruity sound. Perfect for someone an intermediate player looking to upgrade. Comes with a mouth piece each , along with ligature and cap. There is a brand new double case which has space for 3 barrels and accessories . Not only that, it is a backpack case as well. Provided you are resident in the U.K I can send these to you on approval, if you like? Now here is an interesting instrument. It has some extra keys. One of which is on the bottom joint but operated by the little finger of the left hand. The other one is the small one between the 2nd & 3 rd fingers of the left hand (see pictures). I am sure they have some advantage. A nice wooden instrument with no cracks , chipped tone holes, splits, pinning. 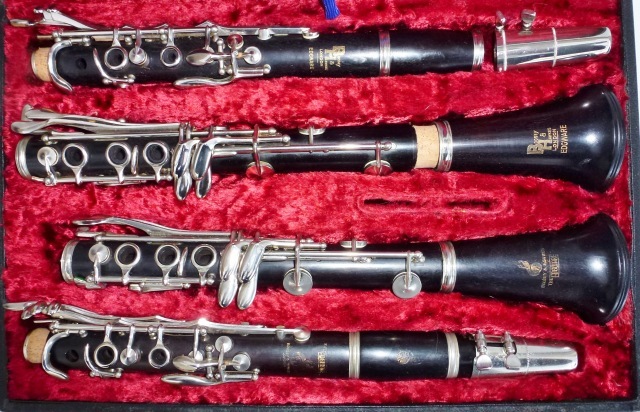 The keys are in very good condition with a bit of wear here and there, as one can expect from an classic clarinet. It has had a service so is in full working order. Comes with a mouthpiece, lig & cap and a hard case. Provided you are in the U.K I can arrange for you to see it on approval. Please ask for details. and regulating. You will notice I have used brown leather pads. Ideal intermediate instrument. Easy to blow and is nice and responsive. Comes with a mouthpiece Lig & cap plus I have thrown in a brand new case. Here we have a Selmer Signet Special Bb. All wood. These clarinets do not come my way very often so I would snap this up if I were you. It does not have any cracks, Chip tone holes , Pinning or anything like that. The keywork is in excellent condition. 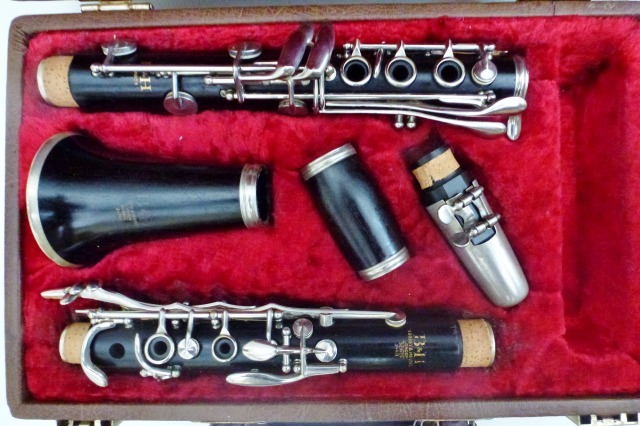 A little worn here and there as one may expect from a classic Clarinet. Quite a delightful instrument all in all. I am also throwing in a brand new case. If you live in the U.K I could let you try it out on approval. B & H Edgeware "A" Wooden clarinet. 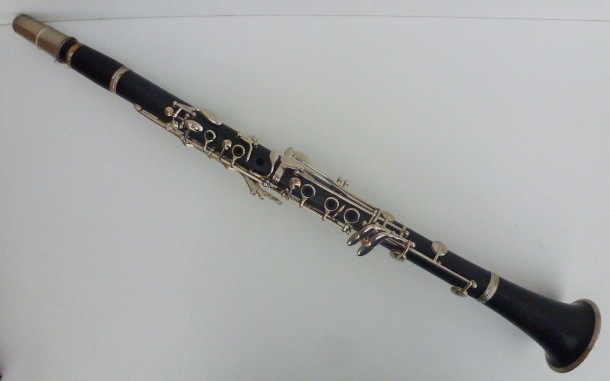 Edgeware wooden "A" Clarinet. From the Boosey & Hawkes Factory in Edgeware, Hence the name. Excellent condition. No cracks, Chips, Cracks, Pinning etc. Keys are also in pretty good condition. Has been through the workshop and is all up and ready to go. Nice clean instrument. Would suit an intermediate player who is now looking for an "A" . It comes with a Brand new double case so if you already have a Bb you can put them both together. The case also has the advantage of being a backpack. Also comes with a Boosey & Hawkes mouthpiece, some Bore oil, some cork grease, and a rubber thumb rest. The serial number, should you wish to look it up is 341484. Provided you are in the U.K it is possible to send it on approval. 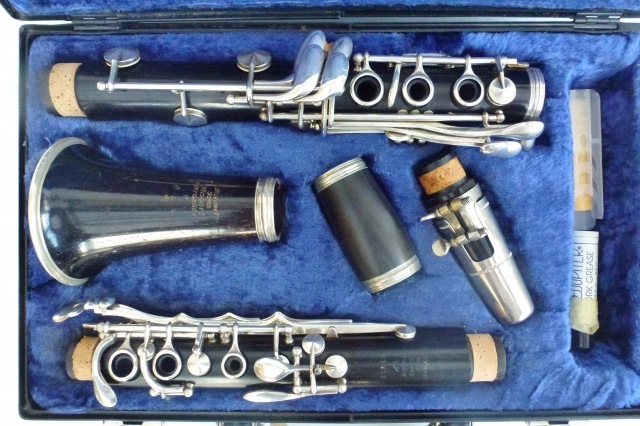 Boosey & Hawkes Emperor Bb wooden clarinet. Excellent condition. No cracks , pinning, Chips etc. Keys are in all good. I have serviced it and it is all ready to go.Has a great tone to it. Would suite an intermediate or advanced player who wishes to upgrade. Comes with a brand new compact case, a B&H mouthpiece , lig & cap and two barrels. The serial number , should you wish to check it out is:- 353036. If you live in the U.K it may be possible to let you see it on approval. Serial No 177012 Wooden Imperial 926 . A much nicer clarinet that the Emperor. No chips, cracks, splits or pinning. Key work in good order. Has been through the workshop and is in good working order. Comes with mouthpiece , lig & cap. 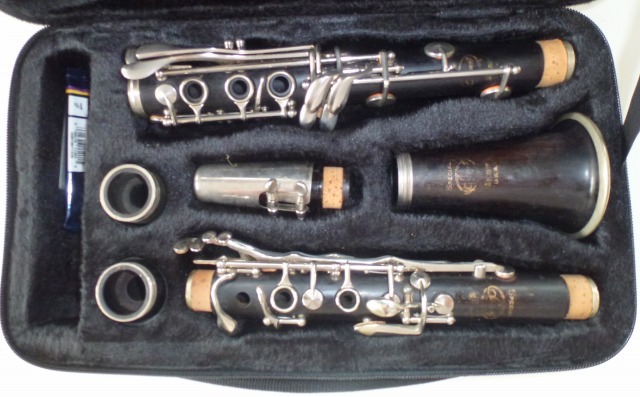 Serial number 358 610 Boosey & Hawkes 2-20 (similar to the Edgeware) Wooden Bb Clarinet, A superb wooden clarinet. The 2-20 was made by Boosey and Hawkes for the export market, primarily for the American market and is in fact the same as the Edgeware. It says 2-20 on the body, though somewhat faded. I do not know how old it is but the serial number I believe is 358 610. This one has no chips, cracks, splits or pinning. The nickel platted keys are in excellent condition. It has been through the workshop, body has been oiled, new cork etc so is in full working order. Perfect for someone who is looking to upgrade from a student instrument as this is Ideal for an intermediate player. It has a 6 month warranty on the overhaul. Comes with a mouthpiece, Lig and cap plus original hard case. 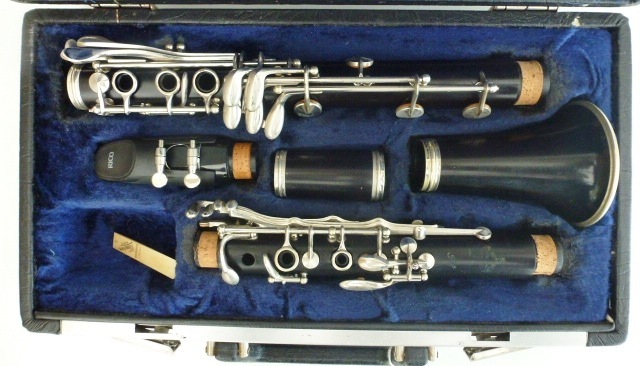 Serial No 185 Bb Clarinet made by Artley, part of Conn in fact.Wooden body, no chips, cracks or pinning. Keys are good condition. Has been through the workshop and is in full working order. Would not only be idea for a student instrument but would also be a perfect second instruments for an intermediate player looking for a spare instrument perhaps . Comes with an ebonite mouthpiece, a lig and cap. Plus I will throw in a Brand new case. Here is a rather unusual wooden clarinet. Though it is difficult to see from the logo one can just about make out the makers name. It is very faint. I believe it was specially made by Artley on behalf of Herbert Couf who was an excellent musician from Detroit. He had a music Shop in Royal Oak, Michigan just outside Detroit where he not only sold these clarinets but also sold his own brand of Saxes as well. He was also first clarinettist in the Detroit Symphony Orchestra. He also started the Royal Music Centre in Detroit where he did teaching and inspired many people to play. Sadly he died in July of 2011 but his instruments can still be found. It is a wooden instrument and has the advantage over a plastic one in that you get a far better sound. No cracks, chips pinning etc. Must admit, the sound is mellow and nice and fruity. Sounds like I am describing a bottle of wine but you know what I mean. The nickel Keys are a bit worn here and there but is as might be expected for an instrument of this age. Pads have all been replaced with brown leather ones having been through my workshop and is in full working order. I have no idea how old this interesting clarinet is as it has no serial number that I can see. 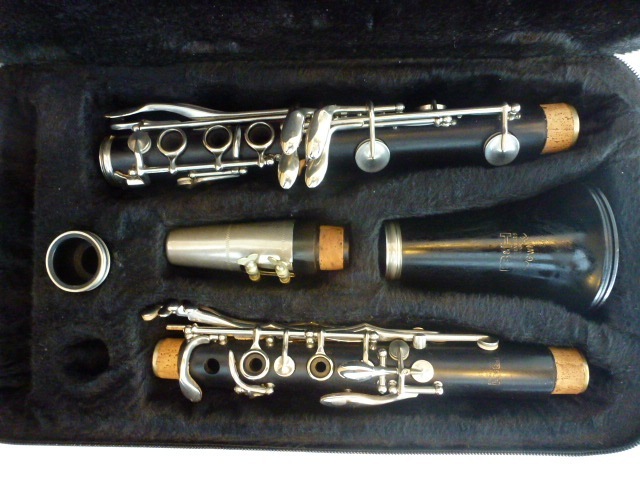 Comes with a BRAND NEW Aquae Sulis compact clarinet case, and I have found an Ebonite mouthpiece to go with it. 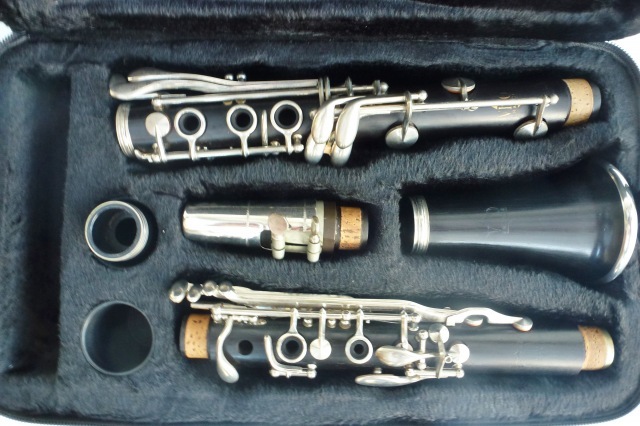 Prelude USA Bb Clarinet (Selmer Bundy) . Has been through the workshop and is all in good working order. Has been checked for leaks etc. Nickel plated keys show signs of wear here and there but not to bad really. There is no mouthpiece with this instrument. Would suit someone who is looking for a reasonably priced beginners instrument. 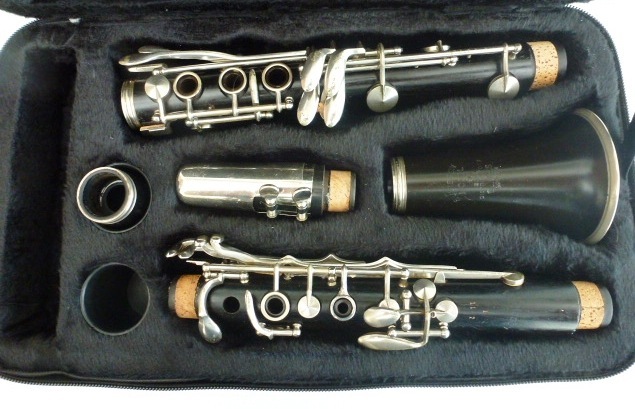 A nice Bb clarinet that is not going to break the bank. Also comes with a cleaning mop and hard case. 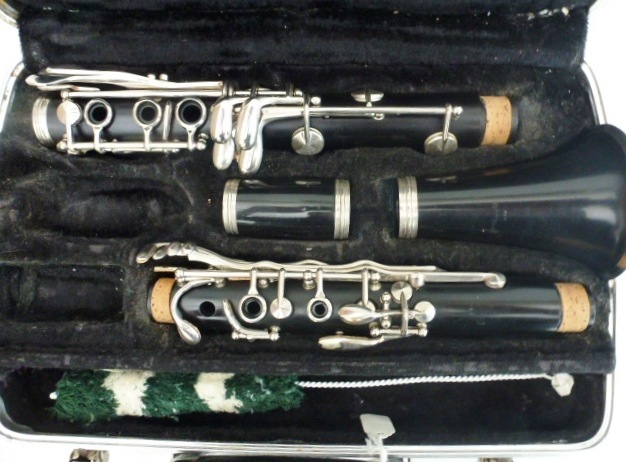 Serial 759058 Bb Clarinet made by Artley, part of Conn in fact.Ebonite . Keys are good condition. Has been through the workshop and is in full working order. Give a great sound. Better than a plastic clarinet. Would not only be idea for a student instrument but would also be a perfect second instruments for an intermediate player looking for a spare instrument perhaps . Comes with an ebonite mouthpiece, a lig and cap and hard case. 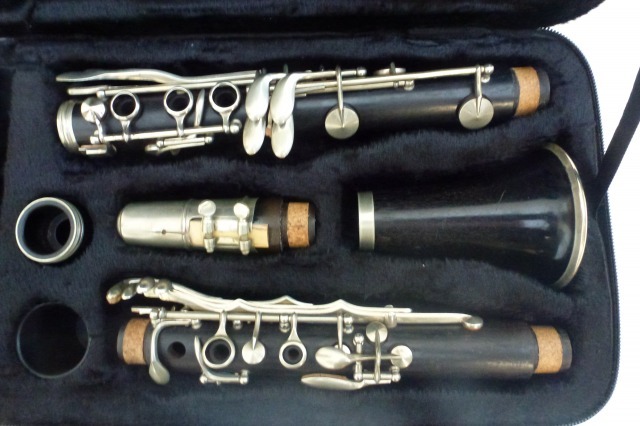 Pair of Concorde "A" & Bb wooden clarinets. .Neither have cracks Splits, Chips or pinning. Both have been serviced and are in full working order. Platting is in good order, maybe a little wear here and there but nothing to worry about. I have overhauled them both That is to say I cleaned, oiled, re corked, re padded them both with brown leather pads etc and now they are all ready to go. 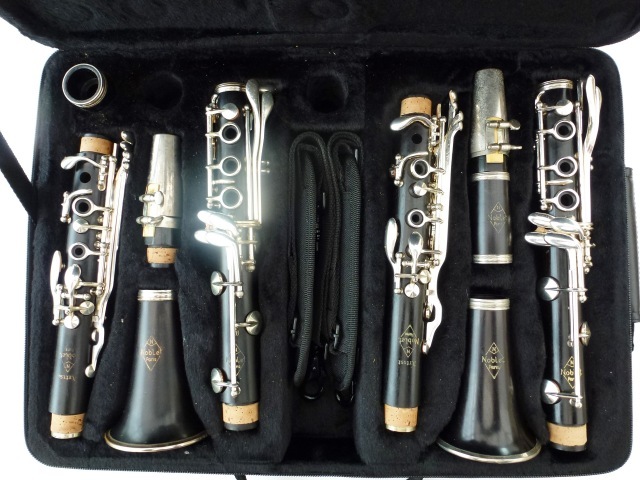 Ideal for someone looking for a pair of "A" & Bb clarinets for a reasonable price. Comes with hard case, Both have mouthpiece lig and cap. 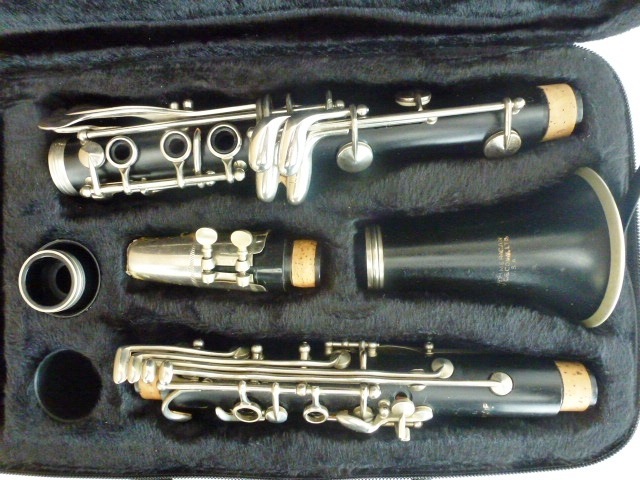 Serial Number 482012 Romilly Rudell Carte wooden Bb Clarinet. No cracks Splits, Chips or pinning. Has both wooden body, Bell and Barrel. Has been serviced and is in full working. Keywork is a bit worn but what one would expect for an instrument of this nature. Do not know the age but the serial number is 482012 if that is of any help. Comes with a nice ebonite mouthpiece ,lig and cap. Would suite an intermediate player looking for a low priced wooden instrument or someone looking for a second spare instrument Good value. 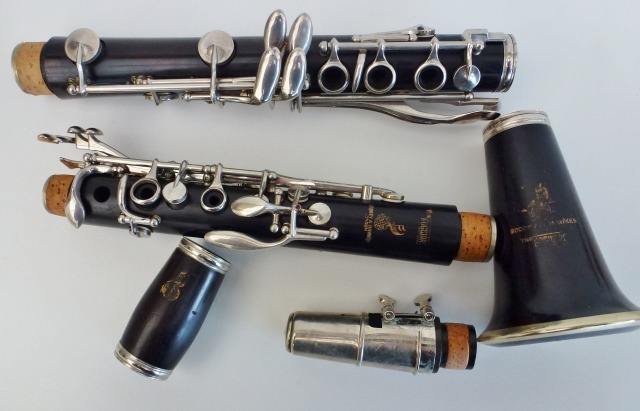 Serial No 1152 Buisson Wooden Bb Clarinet. No Cracks, splits, chips or pinning. The key work I am afraid is rather worn though but hardly surprising with an older instrument. It plays lovely. Not sure how old it is but the serial number appears to be 1152. the bell is Ebonite and has written on it :- "Buisson Model 90" It is , or was on a par with something like an Edgeware for example. It has been through the workshop and as I say in excellent playing condition. In fact you do not get this kind of wood so easily these day. Unless you by new and wooden ones are not cheap. Would suit an intermediate player looking for a reasonable priced wooden Bb clarinet. Comes with Brand new case and there is a decent Ebonite mouthpiece and cap with it. Plus Cleaning cloth. SOLD TO A GENTLEMAN FROM THE NEW FOREST. 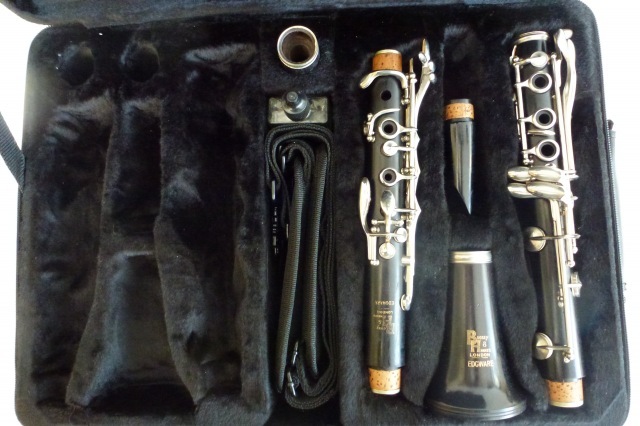 Buffet RC wooden Bb clarinet with an ext Boehm system , which means it has an extra key on the bottom joint which will take you down to Eb (See photo). It has no cracks, chips or pinning. It has had a complete overhaul in my workshop. That is to say that it was stripped down, the body oiled, re corked and re padded with brown leather pads. The keys were oiled and regulated. It has a nice fruity sound. Ideal for someone looking for something unusual. Comes with mouthpiece, Ligature and cap. Serial No is 185421. If you live in the U.K I can arrange for you to have it on approval. In order to give it a test drive, so to speak. Please ask for details. A wooden Noblet all wooden clarinet . 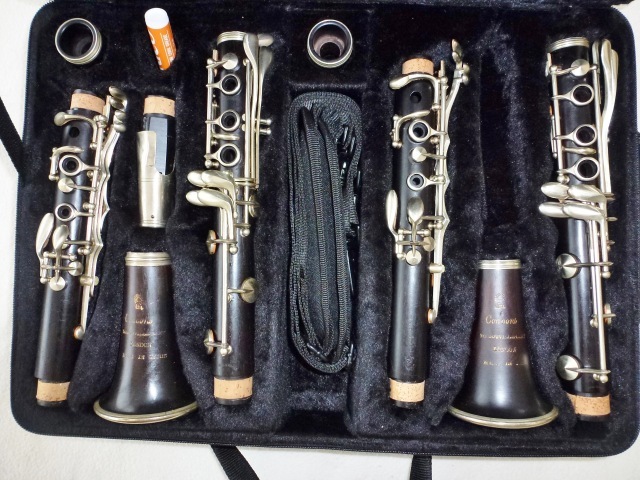 A good example of Noblet clarinets at there best. No cracks, pinning ,or chipped tone holes. 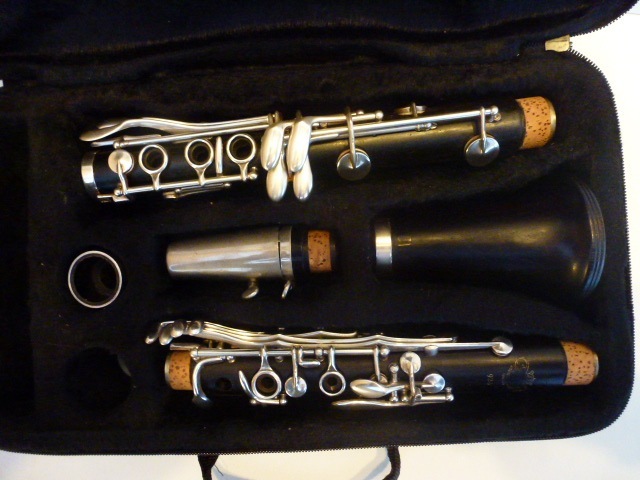 Nickel plated keys are a bit tarnished as one might expect for a vintage clarinet like this. Has just been overhauled , oiled , repadded etc. Plays beautifully. Come with a Noblet ebonite mouthpiece, berg Larson Ligature. and a cap. plus it also comes in a brand new case. Provided you are in the U.K I could send it to you on approval. Shipping is free in the U.K.
A rather nice Wooden Boosey & Hawks Emperor Bb wooden clarinet which is considering in very good condition. The silver plated keywork is in excellent condition. The body has no cracks, pinning, chips etc. I have given it a full overhaul and repadded it with leather pads. This instrument is suitable for an intermediate or advanced player. A nice easy instrument to play. Comes with a Boosey & Hawks 926 Ebonite mouthpiece with ligature & cap. There are also two different barrels. It also comes with its original case. If you live in the U.K it is possible I could send it to you on approval. Please inquire.